UCLA Athletic department mobilizes a team of interns to engage with fans across multiple sports. What better venue than at an athletic event to build a list of fans to which to market season tickets. Armed with iPads loaded with iCapture, the team quickly qualifies and captures interested supporters to which they can regularly communicate about season ticket packages, or special offers for individual game tickets. 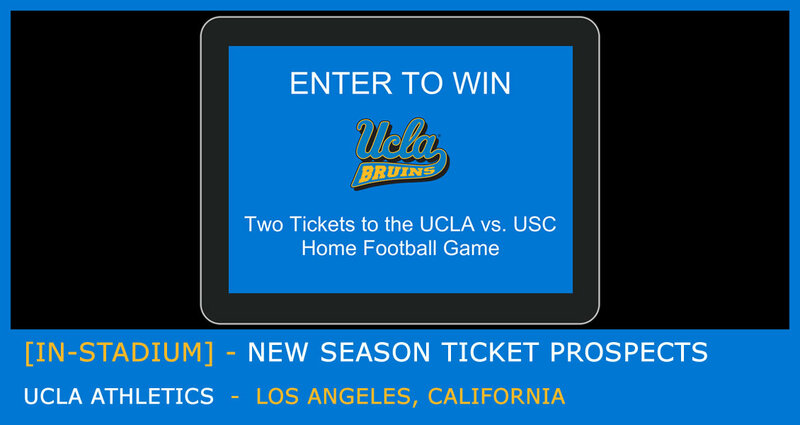 UCLA conducts a drawing for single game tickets as an incentive to sign up. With iCapture’s pick a winner feature, the marketing team can randomly draw winners from the names entered. The call-to-action Screen Saver also features UCLA’s widely recognized logo and team colors. UCLA’s marketing team uses a simple yes/no question asking permission to email season ticket prospects in the future. Those fans not interested can say “no thanks” and still be in the drawing. A “yes” answer instantly qualifies those more likely to purchase in the future. Packing an iPad and a smile, marketing interns go wherever the fans are; inside or outside the Rose Bowl, Pauley Pavilion, or the softball field and never have to worry whether an internet connection is available. By launching the iCapture App on the iPad when internet is available the data syncs instantly with their iCapture database.